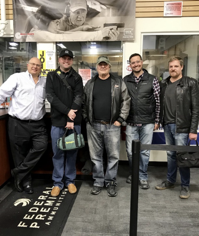 Last week Autobahn Members were invited to Mega Sports in Plainfield for some range time and a friendly shooting competition. Members were given the exclusive opportunity to shoot the brand-new Glock 48 in an accuracy competition. Winner, Mike Gelbort is a person you do not want to mess with placing 5 out of 6 shots on a playing card from 15 feet away. The second-place winner was Brad Beall and a close second at that. Thanks to Mega Sports for letting us fulfill our Rambo fantasies while having fun with friends. A big thank you also to all the Members who braved the ice storm to come out for all the fun and camaraderie.